It would seem the walking dead are still as popular as ever. So popular, in fact, that Marvel keeps pitting it’s most popular characters against them. Case in point today is the upcoming comic Night of the Living Deadpool (great title, btw) wherein the titular character takes on hordes of flesh eating zombies. After waking up from a pretty epic food coma, our hero finds himself in the middle of the zombie apocalypse! And Deadpool’s not the only one with a full belly – there’s plenty of brainless eating machines just looking for their next good meal! Nothing says “tasty meal” like a mutant who can re-grow his flesh! 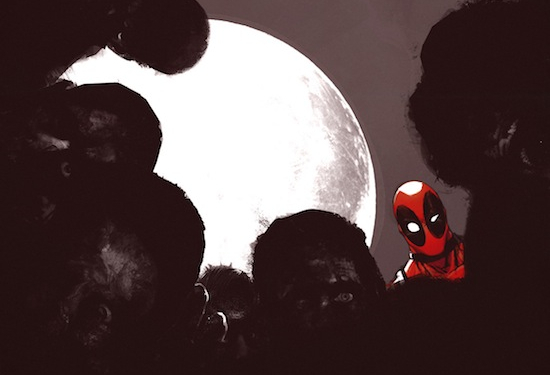 Look for Night of the Living Deadpool, written by Cullen Bunn with art by Ramon Rosnas, to hit stores in January. Check out some preview pages after the break. The Pull List Comic Reviews: ‘Irredeemable’, ‘Marvel Zombies 4’ And More! This is part one of this week’s Pull List, check back tomorrow for part two. Check out last week’s Pull List here and here! After hearing all the buzz about this series, I went back and picked up the first issue as well as this week’s new release with issue #2. This issue picks up with Kaidan, a former teammate of the fallen hero, The Plutonian, on the search for any information regarding just who the new rogue used to be or what may be his weakness. Kaiden’s journey takes her to the ruins of Sky City, a place she and the Plutonian used to protect together, which is now just a scrap heap left in the Plutonian’s wake. Her journey takes her to a woman who was once the Plutonian’s girlfriend and in hearing the girl’s tale, Kaidan must also look back on her own experiences with someone she once considered a friend in order to see what may have caused him to snap. Writer Mark Waid does a great job of overlapping super hero action on a gritty detective story. While the book has many of the standard super hero conventions that seemingly parody characters like Superman, such as his utterly laughable “secret” identity and the ability to fly to space in back in mere moments, the Plutonian is as far from the Man of Steel as they come. Something has really snapped in this former hero, as witnessed by his actions in the first issue to one of his former teammates the Hornet, as well as the Hornet’s wife and baby. And while the actions of the Plutonian are gruesome in their own right, the scariest part about him are the moments left unseen and without description. Leaving only the aftermath as evidence, the reader is only given a small peek in to the obviously broken psyche of the man who was once considered his world’s greatest hero. Peter Krause does a great job illustrating the story in a style that resembles Dynamite’s The Boys. The two books actually share a lot in common with their takes on the super hero genre.